In a reading workshop, students often read their own books at their own pace, books that they choose themselves. While there is space for this kind of independent reading in AP Lit, whole class novels are also important. Discussion surrounding a difficult shared text is critical for building students’ interpretive reading skills. In a reading/writing workshop AP Lit class, then, how to balance the need to do some whole-class books with the workshop value about student choice? When it comes to whole-class novels, there is so much room for student choice if you invite them to determine the focus of discussion with the text rather than making these decisions yourself. This goes a long way toward engaging students. It also enables them to struggle with a text authentically as a reader, determining what about it seems most important to discuss in order to uncover meaning. Much of this I picked up from an AP Lit teacher from Chicago, whose name I no longer have in my memory. He was my instructor in a week-long College Board institute at Illinois Wesleyan in the summer of 2000. I’m also anxiously awaiting the copy of A Novel Approach by Kate Roberts that I ordered a few days ago to see what ideas she has surrounding whole class novels within a workshop setting. I talked more about this in my post about inviting students to do the required reading in AP Lit. But the idea here is that we don’t start our work in earnest with a text until everyone has read it. I do provide some supports to students as they are reading to help them with comprehension and to encourage them to keep at it (the post I linked to above outlines this). But we don’t get to step two until everyone has read the book. In my classroom in Illinois where I first taught AP Lit many years ago, I would crowd the class around the chalkboard on the side of my room, ask for two scribes, and instruct the rest of the class to tell them what to write with this prompt: what do you know about/wonder about/think is important or confusing about the book? For most of this past school year, my first year back to AP after about 15 years, I thought I’d try some technology to accomplish this that I didn’t have before: Padlet. If you’re not familiar with Padlet, it’s basically an online bulletin board where people can post notes (see my class’s Padlet brainstorm on Frankenstein). The high-tech approach has some advantages for sure, but what was missing was the collective conversation. Somehow when everyone has computers in front of them, it’s difficult to get them to really talk to each other out loud. They got into some individual back-and-forth conversations on the Padlet, but each student was focusing on/working with a different part of it at the same time. It didn’t match the experience of my students doing the big brainstorm together on the chalk board in the classroom, where they were all looking at and working on the same emerging diagram together. First hour’s brainstorming session to discover topics for class discussion of Beloved. Collectively they wanted to make a timeline of what happens in the text in chronological order, but they quickly abandoned this when it became too difficult, which made them realize we should probably talk about the narrative structure of the text. Second hour’s brainstorming session to discover their discussion topics for Beloved. The first task I gave them was to just cover the board with thoughts/components of the book that seemed important, using the same prompt I used in the past. Then I asked them to make some connections–that’s what all the lines are. Lastly I asked them to identify what seemed most important. That’s the items circled in 1st hour’s brainstorm and the items notated with a different color in 2nd hour’s brainstorm. I did ask my students which approach they preferred, low-tech or high-tech, and some wished we had done the Padlet again, but most preferred the low-tech experience for the different kind of whole-class conversation it inspired. I’ll likely continue to do this low tech in the future. The discussion topics settled on by each class. I always invite the students to assign one day and one topic to me. They usually make it what seems most difficult to tackle, and they often assign me the first discussion day, especially if it’s coming up quickly (which was the case here). Then we fill in the other discussion days with students as discussion leaders and topics that they determine on their own. You’ll see the topics they chose in the table above. You’ll also see that I had a practicum student from the local university with me this past semester and she took one of the discussion days as well. It’s a requirement for my class that every student leads a discussion at least once per semester. And I give them resources: instructions that include links to other supports they can consult. For our very first book of the year, I model several discussion days for each class so they can see what we’re aiming for: discussions focused on essential questions that get us digging into the text together to uncover meaning. 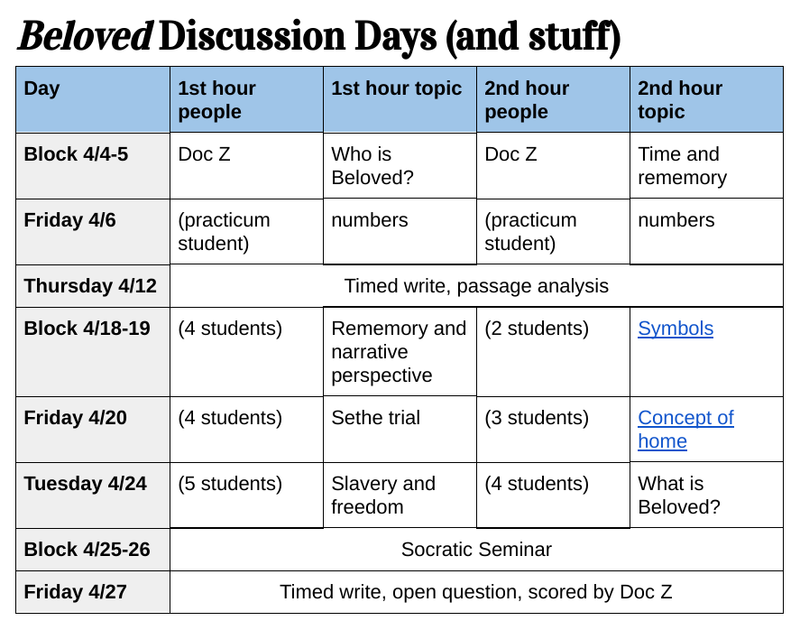 Our last discussion day is always a Socratic Seminar (my Socratic Seminar guidelines are here). This gives us the opportunity to hit any lingering topics that didn’t get covered on the other discussion days and to try to pull it all together. I always ask the same questions, one at a time, with several minutes of student-led discussion in between them: What’s the most important argument that this book makes? Is it a true argument about the human experience? Why does it matter to you as a human being in the present day? How does this book change you? (inspiration for these questions comes from Mark Edmundson–two of his books, Teacher and Why Read?, have heavily influenced my approach to teaching literature). Students come to these Socratic Seminars with the same ticket each time prepared ahead of time in their writer’s notebooks: a detailed list of at least 10 things they want to remember about the book. Having this in front of them during the seminar keeps it focused on their own individual reading experiences with the book rather than on what MY interpretations are. But the seminar does give me some space to jump in with any big ideas about the text that I want students to be sure to think about. In the case of Beloved, I wanted to ask the students to think about Morrison’s concept of rememory alongside the past/present narrative structure of the text as being a possible explanation of how slavery trips us up as a country. It’s a traumatic past that constantly surfaces unbidden and affects us in our present day. My students pointed to the example of the two black men arrested in a Starbucks in Philadelphia while waiting for a business meeting—we continue to struggle with race. Morrison offers us a framework to think about that struggle. Our discussion days run by students were excellent, but we hadn’t quite pulled it all together yet to explore what the book was saying about our country’s history with slavery and how that has affected race relations well into the present day. So I made sure that at least some minutes of the Socratic Seminar asked students to reflect on that. There are other items in the schedule up there–the passage analysis and the open question timed write. For each book, I devise some kind of passage analysis task that gets students deep into some critical portion of the text and place the task at a point in our discussion schedule so that the close text analysis will inform our further discussion work with the text. With Othello, we analyzed Iago’s soliloquies to figure out what motive he had, if any. For Beloved, we dove into chapters 20-23, the ones where the novel drops us into stream-of-consciousness narration from each of the three main characters to make sense of their deepest motivations through their unspoken thoughts. For the open question timed write, I select actual open question prompts from past AP Lit exams that line up with what the students have been discussing with the text. This way, from the very beginning of our work with a shared text (brainstorm) to the very last thing we do with it (open question timed write), the focus is on what the students find important about the text and supporting them as they work to interpret difficult works of literature on their own, rather than watching me do this important work. Yes, it’s possible that due to this student-driven approach, we could end up NOT discussing some aspect of a particular text that is likely pretty important. I’m okay with that. Let’s be honest–any one of the books on an AP Lit syllabus could be the focus of an entire course on its own and there would still be things left to discuss. Turning all of this over to the students benefits them as readers and thinkers and human beings, and that’s more important than any particular content about a piece of literature or canonized interpretation of it. In short, there is plenty of room for workshop-style student choice in an AP Lit class that requires students to read a set of novels together. Create space for students to have their own interpretations about the texts and build a structure for the class to tease out and focus on those interpretations. Teach them how to read and make sense of works of literature–the best practice we can offer them in reading their own lives in our complex world. This entry was posted in #WorkshopWorksForAP, 21st century teaching and learning, AP Lit, blog series, cultivating real learning, engagement, literacy, reading, summer 2018 blog series, teaching literature, teaching reading, workshop teaching. Bookmark the permalink.